Mephisto, based on the novel by Klaus Mann, Hummelinck & Stuurman Producties, Amsterdam, 2006, Dutch Het Theater Festival, 2006. Stuurman Producties, 1999/2000, Biennale Bonn, 2000. St. Louis Blues, opera by Chiel Meijering, InDependance/Orchestra De Ereprijs, Arnhem 1995. King Lear, by William Shakespeare, Theater School, Amsterdam, 1997. Ivanov, by A. Chechov, Theater School Amsterdam, 1995. Forbidden Reproduction /Verboden Reproduktie, based on the novel Love Act by E.M.Austen, Southern Comfort/Baal, Amsterdam 1987. UBU, by Alfred Jarry, Het Vervolg. Maastricht 1984. Mephisto, adaptation by Ariane Mnouchkine of the novel by Klaus Mann, with music by Jean Lambrechts, Theater School Maastricht, 1983. Fear and Misery in the Third Reich/Angst und Elend im Dritten Reich by Bertolt Brecht, with music by Jean Lambrechts a.o., Theater School Maastricht, 1981, KRO-TV 1983. The Measures Taken/Die Massnahme by Bertolt Brecht, with music by Louis Andriessen, Director’s Department Amsterdam Theatre School, 1972. Der Mann der…/The Man who, by Peter Brook/Marie Hélène Estienne/Oliver Sacks, Neues Theater, Halle (Saale) Germany 2007. Flametti, an original ‘montage’ play based on poems and documents of the DADA-movement and the novel by Hugo Ball, with music by Annemarie Roelofs, Schlicksupp teatertrupp in collaboration with the Rotterdamse Toneelraad, Frankfurt am Main, 1982. Recklinghauser Ruhrfestspiele, Salzburger Festspiele. HR/ARD-TV 1985. The Breadshop/Der Brotladen by Bertolt Brecht, with music by Alfred Harth, Schlicksupp teatertrupp, Frankfurt am Main, 1980. Festival of Fools Amsterdam, Berliner Festspiele, Wiener Festwochen. Recklinghauser Ruhrfestspiele. The exception and the rule/Die Ausnahme und die Regel by Bertolt Brecht,with music by Heiner Goebbels, THE ON (c) E AND ONLY THEATER GROUP, Frankfurt am Main/Berlin, 1976. 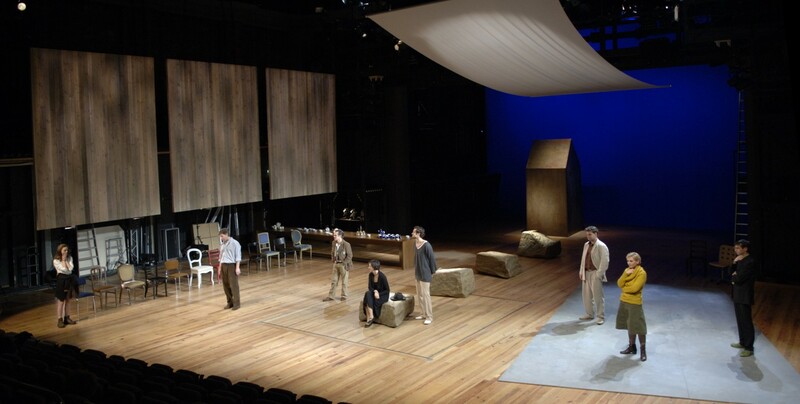 Man is Man, by Bertolt Brecht, Tisch School of Drama, New York University, 2007; The Elephant Brigade, HERE, Centre of the Arts, New York, 2007. University, workshop performance on invitation by Toni Morrison, 2004. Black Box, based on the novel by Amos Oz, readings in HotInk Festival New York and the McCarter Theater in Princeton, 2004. The building of the Union Pacific Railroad, an installation performance, in collaboration with Albert Hunt/Bradford College of Art, Serpentine Gallery, Hyde Park London, 1972. Big and Little, by Botho Strauss, Haiyuza Theatre Company, Tokyo, 2000, for Festival 400 years Netherlands and Japan.